It’s nice to have a few fun math picture books thrown in with your usual bedtime reading to help get kids thinking about math as part of their everyday world along with stories of pirates, animals or whatever happens to interest your kids. Here are a few books that my children and I have enjoyed lately that can help spark an interest in math concepts and ideas. The Boy who Loved Math by Deborah Heligman and LeUyen Pham I love this book. 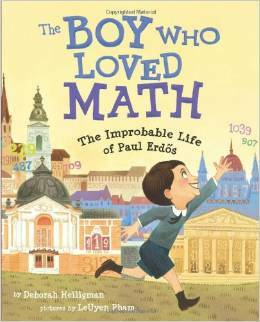 It tells the story of Paul Erdős who had the most incredible life as a mathematician. He was a prodigy with two math professors for parents. His mother had lost two daughters to scarlet fever before Paul was born, and as a result she was extremely over protective with Paul, to the point that she didn’t want him going to school for fear of him picking up any germs. Staying at home and left to his own devices, he was able to develop his mathematical ability. Paul Erdős was so focused on thinking about math that he lived a very unconventional life, including never learning to butter his own bread, do laundry or drive a car. Instead he relied on friends and colleagues to take care of him, and in return he would travel around the sharing his knowledge with other mathematicians. He wanted to spend all of his time thinking about math. Paul Erdős was such an interesting figure because he lived the way that he wanted to live without regard for social convention, money, fame or status, which is a very appealing idea for kids (and adults!). He shared himself and his mind and he showed the world that math can be fun. 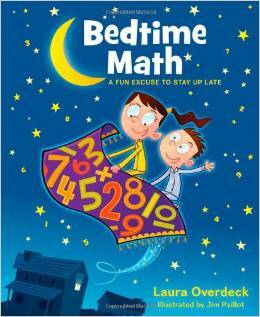 Bedtime Math Stories by Laura Overdeck and Jim Paillot My kids can’t get enough of this book. The book is arranged into short stories about food, animals, vehicles, sports and odd jobs that are followed by questions to be answered. My 6 year old and my 9 year old are both able to take part in trying to figure out the answers to the mental math problems because for each story there are three levels of question to answer (Wee Ones, Little Kids, Big Kids). The only problem with this book is that it might keep your kids up late wanting to complete another story. Luckily there are two books in the series and judging from the success and how much my kids like these books there are sure to be more on the way. The illustrations are great and sometimes cute and funny. Highly recommend this book for anyone who wants to help get kids thinking about math. Check out their website and a Facebook page. 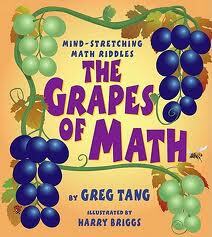 Greg Tang has a whole series of fun math books. If you like Bedtime Math the Greg Tang books are a little bit similar in style. He has written two books of math fables for the younger kids and a number of riddle based problems books for older children. You can read the books for free on his website, and be sure to check out the rest of the Greg Tang site for fantastic free math resources, especially the Kakooma section of the site; it is a lot of fun. 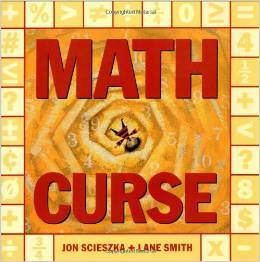 Math Curse by Jon Scieszka and Lane Smith Math Curse is an older book, but it holds up well. It follows the idea of math in everyday life, and shows how it applies to everything. The books start with a teacher telling her class that “You can think of almost everything as a math problem”. The next day the main character wakes up and sees everything going on in her life as a math problem, so she thinks the teacher has put a math curse on her. It’s a fun, interactive book, that will help kids see how math relates to their daily lives and it introduces them to all sort of concepts like volume, time, fractions, measurement, and money in a humorous way. This book would be especially great for teachers.